Martin Hill (AUS1449) sailing with Sean O’Rourke, Julian Plante and Matt Belcher is the new overall leader after finishing second behind Chris Hampton (AUS1443) in the second race of the championship. Only one race was completed on day 2 as light winds again shortened the available time on the water. 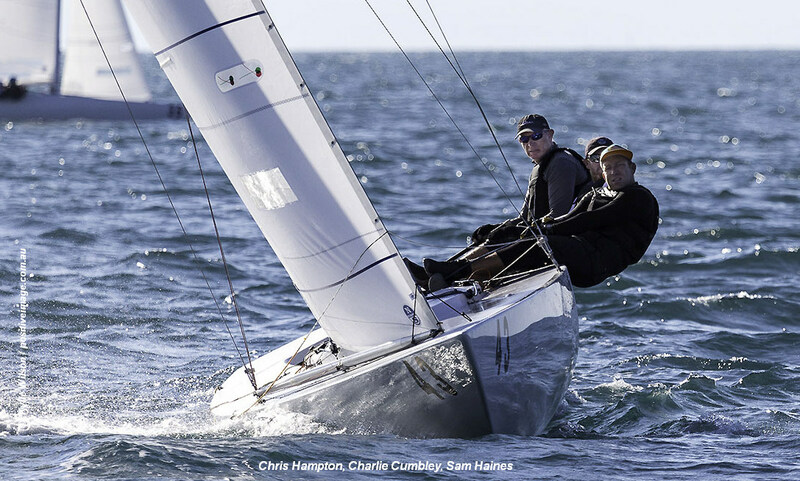 Chris Hampton, sailing with Sam Haines and Charlie Cumbley, took the race 2 win ahead of Hill with Peter Duncan (USA926), sailing with Andrew Palfrey, Victor Diaz de Leon and Sasha Ryan in third place (11th overall). Overall Hampton moves into second place, and up into third overall is Tom King (AUS1442) after finishing in fourth, while Mark Thornburrow (HKG1406) is now fourth overall after an eighth place finish. Bruce Ferguson (AUS1330) drops back to fifth overall after a fifth place finish, and also slipping back is Jud Smith (AUS1377) now sixth after a 14th place finish. While most of the top ten from day 1 managed to record a reasonable result in race 2, overnight leader Iain Murray (AUS1461) was caught by the U Flag at the start and drops to 49th place overall. Britain’s Lawrie Smith (GBR1434) finished 29th and remains in 20th overall. Rob Goddard (GBR1329) was caught by the UFD and is now 89th overall.